As part of another attempt to de-clutter my apartment, I spent yesterday sorting through stacks of art supplies. Like coming across old snapshots, paintings take me back to the time and place where I painted them. 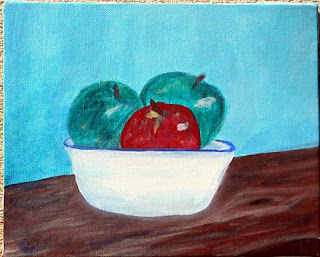 "Green Apples," an attempt at a classic still life with somewhat atraditional color choices, was painted on the balcony of a beach house rented for the Sisters Beach Trip 3.0 the week after Hurricane Irene. My sister was working on a painting too, hers of shells. At the time, I wasn't much thrilled with my effort. Now I find I like it much better, perhaps because it returns me to a warm balcony with ocean air full of familial love, acceptance, and creative exploration. Those are some darn good apples in that context.